Stripping paint, stain or varnish from wooden furniture is a simple process that is essential for any refinishing project, especially if you wish to stain the wooden piece that you are working with. I HIGHLY RECOMMEND THAT YOU STRIP FURNITURE OUTSIDE SO THAT YOU DON'T GET SICK FROM INHALING TOO MANY FUMES!!! In order to ensure proper stripping technique you will need to follow the instructions below! 3. Remove all hardware or other accessories that may get in the way. Here I removed the seat belt with a screw driver. 5. Put on Rubber Gloves. 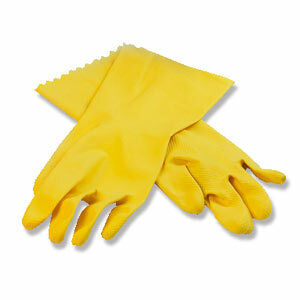 This will protect your hands from the powerful chemicals found in the paint stripper. 6. Get your paint and varnish stripper ready, and pour it into a metal painting tin. The tin must be metal due to it's powerful stripping power! I chose to use the above paint stripper for my project. The fumes were not as strong as many of the other paint and varnish strippers on the market, yet it had marvelous stripping results. 7. 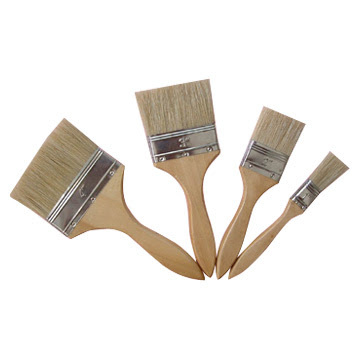 Get your paintbrushes out! 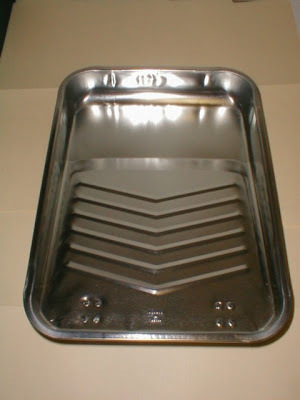 I had a variety of sizes due to the different sized surfaces that I would be working with. 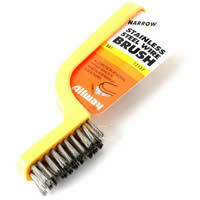 You don't need the most expensive paintbrush for this part... just something to get the job done. Simply use the paintbrush of your choice to "paint" on the stripper. In my case the stripping gel that I used came out very thick and a little lumpy.. NO WORRIES!! Be sure to paint the stripper in the direction of the grain! Cover all the surfaces of wood on the piece of furniture that you are stripping. Let the stripping gel set in for 30 min or more. I waited an hour. 8. When the orange stripping gel turns hard, dry and whiteish in color it is time for the plastic stripping tool and small stripping steel wire brush. 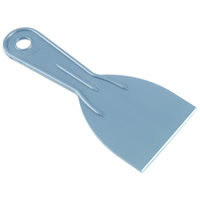 This tool is very handy indeed. 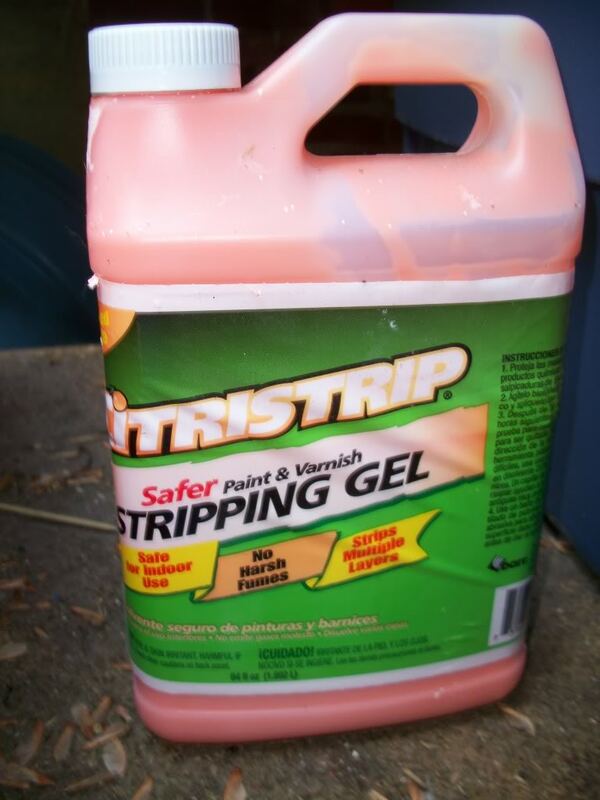 Use it to scrap away all the hardened stripping gel. Along with the stripping gel you will automatically scrape away any paint, varnish or stain that was on the piece of furniture that you are working on. It is like MAGIC! 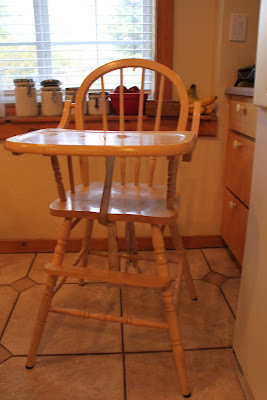 I used this brush for smaller areas, such as the spindles on the back of my highchair and the small crevices that the plastic scrapper couldn't reach. It worked wonderfully. Be sure to scrap the stripper off in the direction of the grain of the wood. 9. Last but not least, wipe all the excess stripper gel off with a warm washcloth. If that doesn't do the job you can use a little bit of paint thinner to the stubborn areas. Congratulations, your furniture is stripped! The traditional key to any great looking varnish job is to build up numerous coats of the best varnish you can afford, sanding in between each coat until a flat and uniform surface appears. Nicely done on the renovation. Will have to give this a go with my teak outdoor furniture. The stripper I am using is coming out in lumps as you mentioned. How can I prevent this from happening?